Welcome to Blue Mountain Beach, along Florida's Gulf Coast, with a lot to offer! Come here for the vacation of a lifetime. Our Blue Mountain Beach properties come equipped with all of the amenities and appliances you will need on vacation. The beutiful white sand and clear water will take your breath away. With easy access to the beach it is not hard to spend the whole day hanging out by the water. After a day of fun! You'll be hungry, but don't worry the food here is out of this world. Make sure you stop in at our local restaurant like, Nick's On The Beach for some great food in a nice dining room. 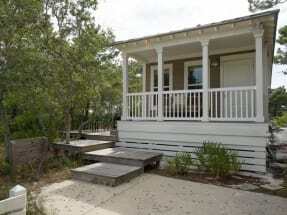 Or on a beautiful outdoor porch with amazing view of the beach. Also enjoy For the Health of It, a local 4.9 star restaurant. The opportunities for a good time, are endless! Enjoy many of the different activities such as fishing, paddle boarding, and bike rentals. Spend your trip on the white sandy beaches near the sky blue water and bright sun, and just relax. Browse our Blue Mountain Beach FL condo and house rentals below. If you have any questions contact the property owners directly, they will gladly assist you in the booking process. Booking direct with the property owner allows you to get a better insight on the property and assures you are getting the best rate possible. ECBYO does not charge any service fees when you book with us! Don't forget to book online today!